Head coach Mario Cristobal savored two Thanksgiving treats: dinner with his team and family, and the next day, for dessert, a 55-15 win over rival Oregon State in a Civil War game that was never as close as the final score indicated. The outcome revealed that Oregon could dominate the line of scrimmage and run roughshod over the worst Pac-12 defense in memory. Question is, could the Ducks do the same to better defenses in the league? The other question is how serious is quarterback Justin Herbert’s injury that put him out of the game in the second quarter? Cristobal could have trotted out his scout team quarterback and still stomped the Beavers as this game played out. One had to feel for first-year coach Jonathan Smith, who had to watch this mess 12 weeks in a row; but enough about that. 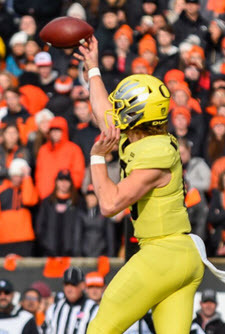 When the gun sounded, Cristobal could point with pride that his Ducks were able to get themselves together and end the season establishing important goals that were set before the season. Oregon worked its way out of a major slump during the season and prevailed over a flurry of injuries and lack of depth. Oregon’s defensive backs have improved their pass coverage the past three games. In this example above, Deommodore Lenoir (No. 15), gets his hands on the OSU receiver as he makes his cut on a short post route. This disrupts the timing and focus of the receiver who is left whining about a pass interference call that wasn’t. Quarterback Herbert puts a soft touch on this beautifully thrown ball above to CJ Verdell (No. 34) coming out of the backfield. Herbert flips the ball to Verdell after going through a progression of tight end Jacob Breeland (No. 27), and a seam route. Brenden Schooler (No. 9), makes a key block on the Beavers’ defender. OSU’s linebacker responsible for covering Verdell takes his eyes off him and zeroes in on Herbert. By the time his vision comes back to Verdell, he is too late to get in a position to adequately cover him. The Ducks’ play caller could call more of these types of plays as Oregon’s running backs are good receivers with excellent open field running abilities after the catch. This play above is an example of one of Herbert’s greatest inconsistencies: the deep pass down the sidelines, that comes down too far outside, out-of-bounds, and too far outside the receiver’s reach. The proper aiming point is to throw the ball down the numbers on the outside, that gives the quarterback and receiver more room to adjust to the ball. It is an easier pass than this one, a long ball that is thrown down the hash mark closer to the sidelines. Herbert has consistently thrown this ball down the hash marks, closer to the sideline and the result of the pass ends up like this one. It is a measure of fundamentals that the quarterback needs to improve upon if he’s going to be a successful NFL draft pick. Here is one reason (above) we haven’t seen a lot from Oregon’s backup wide receivers. Johnny Johnson III motions out of the backfield to his right and receives Herbert’s swing pass. Breeland crack-back blocks effectively while freshman wide receiver Bryan Addison (No. 80) runs past two defenders without noticing/blocking them. One can tell by watching Addison that he has no clue what the play is and where the ball is; he actually keeps running across the field, unaware that the ball is coming his way. Old receiver coaches call Addison’s pattern a “recon” route, totally unaware of what he should be doing on the pass play. By the nature of OSU’s shaky secondary, two defensive backs run into each other and the play is still successful despite the blunder by the young receiver. Don’t count on getting away with this against a good secondary, such as Washington’s. Watch the movement of Oregon’s front seven defense on this running play above. Their pad level is lower than the Beavers’ and they are maintaining control of their respective gap responsibilities and holding OSU’s fine running back Jermar Jefferson to a short gain. It was outstanding defense such as this that held Jefferson to only 64 yards on 21 carries, one of his lowest outputs of the season. Here is an example above of how not to slant, as OSU’s front is attempting do against a Travis Dye run. 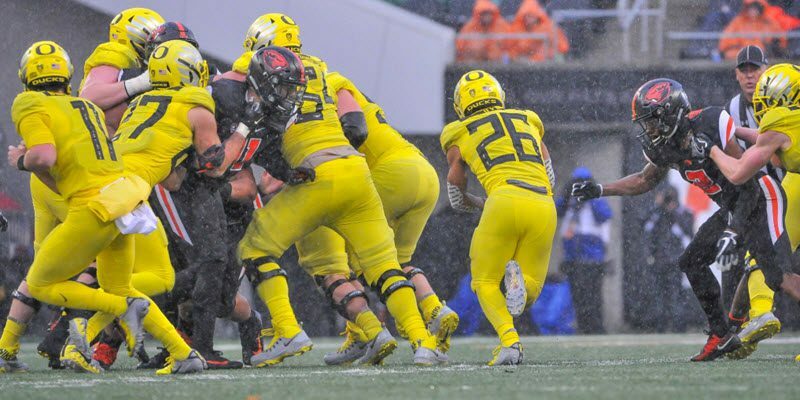 The defensive line’s pad level is too high, which gives the Duck blockers the advantage of leverage. The Beavers have their shoulders turned towards the sideline, putting them in poor position to defend their gaps and establish leverage on the ball carrier. They are literally being run off the field by the Oregon offensive line that opened up holes in OSU’s beleaguered defense for 392 yards rushing. The injury that changed everything: Herbert drops to pass and two blockers (above) allow their men to get past them and sack the quarterback. Oregon’s running back (No. 34) gives a half-hearted effort, lowering his head and not getting square to the pass rusher. Oregon’s left guard (No. 68), gets drawn too far inside when his man slants to his left and can not maintain his gap and pick up the twisting defensive lineman coming at him. It is sloppy pass protection and the result is that Herbert is sacked for the second time and is injured. It appears from the film that he brings his left hand up to his right clavicle which could be similar to the injury he suffered last year against Cal that kept him out of action for an extended period of time. Coach Cristobal can be proud of how his first year as head coach finished up. There was plenty of lackluster play by the Ducks, particularly after the exhilarating victory over the Huskies. There is plenty of conversation by the play calling which has turned exciting Oregon football into a plodding succession of boring line plunges. Cristobal doesn’t care if the Ducks are exciting or not; that’s an opinion for season ticket holders. What he is concerned with is whether his team became more physical than in recent years and could re-establish the running attack, which they did, more or less. Although they did run the ball effectively at times, there were several instances Oregon would rush for less than 100 yards in a game. Herbert’s injury dramatically affects Cristobal’s chances of winning their next game, in a bowl, before a nation-wide audience. Much of Herbert’s potential still sits on the Oregon bench, unused and wasted. If his sack against OSU is his final play as a Duck, it will be an ironic example of the season-long frustration many fans felt for the All-American from Eugene.